The MaxxAir 2-Speed Portable Drum Fan is a big air mover. 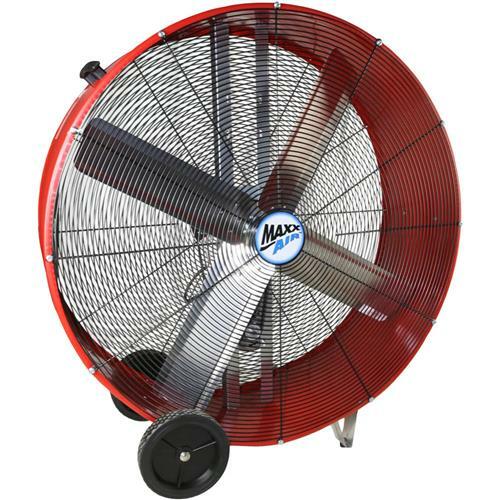 This fan is ideal for moving large volumes of hot air quickly and efficiently to keep people and machines cooled off. This fan is useful indoors, on the factory floor, in a warehouse or in a barn with livestock where high-velocity air movement is needed. This fan is belt-driven for quieter operation and longevity and has a rugged, 22-gauge steel powder-coated housing for durability. The grille is OSHA compliant, rust resistant and powder-coated. The fan is shipped completely assembled, to operate simply plug into a standard outlet. Box Dimensions - 48" x 48.25" x 20.5"